You can cancel your booking without any fee until four weeks before check-in. Cancellation in less than two weeks costs the price of the first night. In case of no show you need to pay the whole amount of the booking fee. We will ask you to pay 50% of the total price of the first night as a deposit in addition to the amount you paid for Hostelwolrd.com. You can take care of the deposit by bank transfer. Please let us know which way would you like to do it! The hostel is in a residential building therefore we are not a party hostel. It doesn't mean that fun is prohibited in our Hostel, but we ask our guest to keep down the volume, especially after 9 o'clock. Thank you for your understanding! 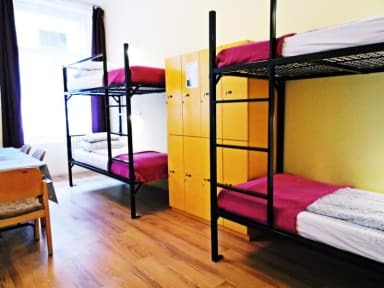 The Budapest Budget hostel is a clean, comfortable place to stay in Budapest. The check in is smooth and the people at the reception are damn helpful. They have a wide range of rooms with well-equipped kitchens and sparkling clean bathrooms and toilets. Highly recommended. My room was on a light and bright corridor. There was even a fish tank. Clean, peaceful and secure accommodation. Close to major sights, Handy for mayor tram route around the city. There was a cheery kitchen provided. Quite dry. No activities. No place for interaction with all guests. Overall it was great. It was quiet at night and in a non-busy neighbourhood so one could sleep easily. NO bugs detected. Clean room and ensuite. The towels could have been cleaner and the pillows seemed quite old, but it wasn't so much of a problem. Staff polite, always available and they can inform you about a range of activities you can do. Located near convenient tram stations. Smoking is prohibited indoors which was a relief. Not a party hostel which was fine by us. Felt safe there. Location is good and there's a market right around the corner. The kitchen facilities were a little bit hard to use at first as there weren't any instructions, but I managed. Locker's good size and safe. Overall experience was good and I would stay there again. Nice staff. Nice spacious rooms. Facilities were good. The rooms themselves are spacious and light, the facilities are really good and the hostel is quiet. However there were tiny ants that were coming up through the grate on the bathroom floor which was pretty gross. Hostel wasn’t as close to the centre as I’d thought but easily walkable. The security was really good, had to unlock 4 different doors before you could get into the room. The shared kitchen was clean and had everything you needed to make a meal. Overall it was great for a short stay! The hostel is very somber and quiet. There’s no real common area so it’s very hard to meet others. The kitchen only has really old appliances so it takes at least 20 minutes to boil some water. There’s one specific guy at the reception who is exceptionally rude, and the housekeepers don’t pay you any mind either. There’s no AC so it’s very uncomfortable to sleep during the summer seasons. The front door beeps whenever someone walks in or out and that beep can be heard from everywhere.